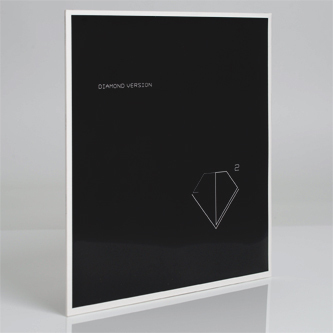 Raster-Noton perennials Olaf 'Byetone' Bender and Carsten 'Alva-Noto' Nicolai return to Mute together under their Diamond Version umbrella, with the second of five EPs. On opener 'Science For A Better Life', the vocodered "do you suffer from pain? / try for free" commands are presumably meant to be a sinister/satirical comment on the hollowness of our consumer society and all that jazz, but they feel a little crass and tacked-on to be quite honest; better to ignore 'em and concentrate on the music, which is probably best described as contemporary techno-industrial rendered in the acute, rigorously minimal sound design common to all R-N product, but with somehow more space, more oomph: this is music built to shake large-scale festival arenas rather than galleries, clubs or concert halls. 'Forever New Frontiers' is way more satisfying: kinetic broken techno that comes over like a more polished British Murder Boys, and just begging to be put to use by DJs of Surgeon and Regis's calibre. 'Shift The Future' is a neat addendum to 'Science For A Better Life', all jacking dropforge kicks and mercilessly distorted synth squall.